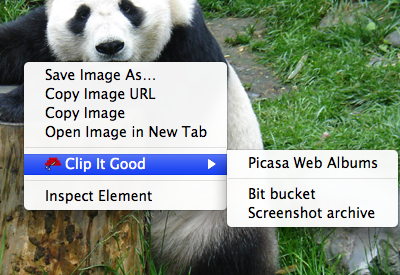 Clip It Good is a Chrome Extension I just published that lets you right click on an image and quickly save it to a Picasa Web Album that you choose. The bummer is that it only supports Chrome 9, which you probably don't have-- more on that later. I like to save pixel captures of websites, so Clip It Good is useful along with screenshot tools (I guess this is similar to how Grandpa cuts things out of the newspaper). Also, a funny side-effect of my approach is it makes it pretty easy to save your friends' photos from Flickr/Facebook (something I've always found frustrating). The extension is primarily an exercise in HTML5-ish stuff. This is where the Chrome nightly problem comes in. Beyond just Canvas, I need Blob, BlobBuilder, and TypedArray, which did not land in the WebKit/Chrome codebases until very recently.